The UK government has been accused of acting in a ‘bizarre’ manner with regards to its treatment of aging Brits and elderly UK expats. Much noise has been made by the Government about the looming shadow of an aging population. According to Government figures, by the year 2090 the United Kingdom will be home to around 626,900 people who will be aged 100 or over, 53 times the amount of centenarians that are in the UK today. With a national debt leading the United Kingdom in to an age of spending cuts and austerity measures, the government is doing all that it can to reduce costs and recoup cash. However, a massive outlay for the government is the billions of pounds spent each year on social care and health costs for its elderly. While enforcing an elderly exodus is obviously a fantastical notion, it is baffling to think that the Government seems to, if anything, attempt to dissuade OAP’s from retiring abroad. 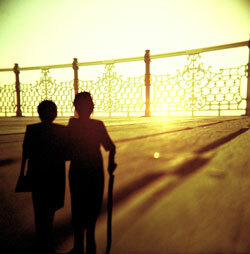 UK pensioners are enamoured by the prospect of enjoying a foreign retirement. Countless surveys have revealed that the majority of over 60s in the UK at one point or another entertain the prospect of retiring abroad, in fact it is generally something they aspire to do. One of the latest surveys, carried out by Opinium, revealed that virtually one out of every two pensioners wants to move abroad. Of course this should come as no surprise, the UK is hardly famed for its great weather and lovely retirement conditions. After a lifetime of working people need to relax, and there are many destinations far better suited to relaxing than the UK. So- it would be good for the Government and pensioners want to do it, why is retiring abroad not encouraged? Aside from the aforementioned billions saved in healthcare, assisting and encouraging OAPs to retire abroad would also create more space in a country where housing is also fast becoming a problem. Yet bafflingly the government’s doing no such thing, and what with the frozen pension storm that is affecting thousands of expat pensioners worldwide also coming into play, it looks very much like the government is pointing a pistol at its foot and pulling the trigger with reckless abandon. While only a handful of countries throw up the frozen pension problem, it is still a ridiculous line for the government to be following considering they would probably make more money if they unfroze said pensions. The same Opinium survey also revealed that an extra 40 percent’s worth of pensioners would retire abroad if the government unfroze pensions.